Sand wedges, one of several types of wedges, usually have a loft of 54 to 58 degrees and are commonly used for getting the ball out of bunkers. When golfers buy a new set of golf clubs, it is likely that only one of the four types of wedges–the pitching wedge–will be included. Still, golfers who want even more precision for the short game often choose to buy one or all of the other three types of wedges–the sand wedge, lob wedge and gap wedge. Pitching wedges are the most commonly used of the golf wedges. With a loft of between 44 and 50 degrees, they are the least lofted wedge and typically used for approach shots between about 90 and 110 yards. Golfers usually use pitching wedges for approach shots to the green, for chip shots that they want to keep low and for long sand or bunker shots. Pitching wedges have the least amount of bounce–generally between about 2 and 5 degrees–of any of the wedges (except, sometimes, for lob wedges). This allows golfers to get the front edge of the club underneath the ball and still make solid contact. Sand wedges are designed to help golfers hit their balls out of the sand, but can be just as productive from the fairway or rough. These wedges have between about 54 and 58 degrees of loft, which helps golfers get the ball in the air quickly. The maximum distance golfers hit sand wedges is between about 80 and 90 yards. Even among wedges, sand wedges are unique since they are built to help golfers escape the sand. They have the most bounce of any wedge–10 to 16 degrees–and the widest sole width, which means the bottom of the club is wider to help prevent the club from digging into the sand. 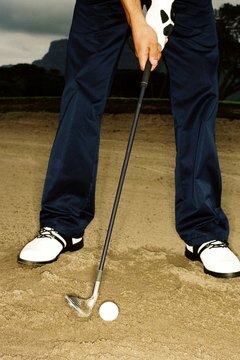 Due to the way sand wedges are made, they propel the ball quickly into the air and cause it to spin. As a result, a ball struck by a sand wedge generally stops more quickly than if it were struck by another club. Golfers generally hit pitching wedges about 110 yards, and sand wedges about 90 yards. So golfers who want to hit the ball 100 yards either have to swing a pitching wedge lighter than they otherwise would, or a sand wedge harder than they otherwise would. Or, they could use a gap wedge, which was designed specifically to be a club to bridge the gap between pitching and sand wedges. Gap wedges have lofts between about 46 and 54 degrees. When they are choosing one, golfers should pick a gap wedge that has a loft that is mid-way between their pitching and sand wedges. Gap wedges with lower amounts of loft are effective when used from fairways or when the ball is on a hard surface, while those with high degrees of loft are especially useful in deep rough, on a soft fairway or even from a sand trap. Lob wedges have the highest degree of loft of any of the wedges–57 degrees or more–and are best used in situations when golfers have to get the ball into the air quickly and have it land softly so it does not roll. Golf balls travel about 60 to 65 yards, high in the air, with a full swing. As a result, lob wedges are often used around the greens and in other situations in which a finesse shot is necessary. They also perform well in the deep rough and anytime the balls needs to stop quickly after hitting the ground. Lob wedges have a sharp leading edge and a small sole width, which allows golfers to get under the ball easily and send it into the air. What Is the Difference Between Golf Wedges?